Summer is practically here, and Central Florida swimming pool owners need to start preparing the pool now for the heavy use it’s sure to get this season as the center for outdoor entertainment, cookouts and general family fun. However, what looks like a simple process might take a lot of time – as well as technical expertise – to get it ready. Why does your pool need attention every season? After the winter hiatus, your pool water is dirty, its water chemistry is not balanced, and the pool equipment needs a thorough check. Readying the pool in the right manner ensures chemical safety, smooth operation, and a healthy swimming experience for your family and friends. 1. Prepare the pool early – Your pool will be ready to enjoy immediately, and you may be able to get early bird discount/deals at your neighborhood local pool store or online stores. You can also head off problems before they escalate and cause expensive maintenance issues, such as algae blooms. 2. Prepare well – As mentioned earlier, opening your pool is a time-consuming and tedious process. You have to make sure that you have everything it takes to open a pool correctly. Make a list of items before going to the pool supply store to avoid a return trip for something you forgot. Typical supplies include chlorine, shock, pH alkalinity, chlorine stabilizer or a spring opening kit. Cleaning equipment includes a vacuum head, telescopic pole, vacuum hose, skimmer head and pool brush. 3. Make sure that your filter and pump are up and running – If you cover your swimming pool during the winter months – or during your absence from a vacation home – make sure that your filter and pump are up and running after removing the cover. And keep in mind that you should leave the filter system running until your pool water is clean and clear. Even when the pool is clean, make sure that you run the filter and pump for at least 10 to 12 hours every day. Florida, where we have empty timeshare properties with swimming pools and part-time residents, and kids on vacation acting like, well, kids on vacation. When hosting a pool party or family day by the pool, ensure everyone is well aware of the rules of safety you have in place. Assign someone to be on alert of any dangerous activity and supervise play. If children are present, never leave them unsupervised. A fun idea to help everyone is clear on the water safety rules is to have children help create a sign listing all pool rules. Hang the rules somewhere everyone can see when entering the swimming pool area. 5. Balance your pool water chemistry – Before you start swimming in your pool, you have to make sure that pool water chemistry is perfectly balanced. 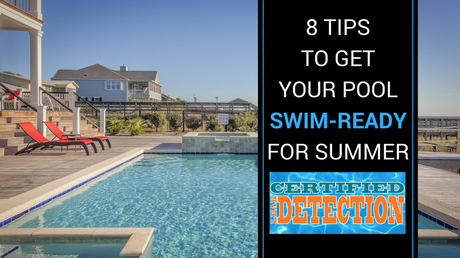 And, once you get your pool water tested from a pro, you will know what and how much to add. Total alkalinity – Make sure that the total alkalinity is anywhere from 80-120. Alkalinity maintains your pH levels. If the alkalinity levels are in the right range, then your pH level will be maintained. pH level – Maintain the pH level anywhere from 7.2-7.4. The pH level determines the amount of chlorine that turns into hypochlorous acid in your pool water. Chlorine – Maintain the chlorine level anywhere from 1-3 ppm. Cyanuric-based tablets are a popular product for in-ground pools. An essential product of an in-ground swimming pool, cyanuric acid inhibits the burning of chlorine. Calcium hardness – This should be in the range of 150-450 ppm. If you don’t maintain the correct calcium hardness, it can damage your pool badly. When pool water becomes too soft (i.e., its calcium hardness drops below 150 ppm), it becomes corrosive. If you don’t manually add calcium or magnesium back into the pool, the water will begin to take what it needs from any part of your pool or pool equipment that contains them, such as stone, concrete, metal, grout, etc. 6. Clean the pool – Make sure that you clean the pool as much as you can – remove the debris, leaves, etc. – either manually or with a vacuum. 7. Shock the pool – Use a chlorine-based swimming pool “shock.” Shock is a granular form of highly concentrated chlorine, which quickly raises the chlorine level of the swimming pool water, killing off all of the algae. 8. Store your winter cover after cleaning it – Your winter cover is a vital pool protection accessory. Clean it properly and store in a safe place. Of course, your pool requires constant attention. It is not as if the hard work is required only at the start of swimming season. You have to regularly clean the filter, test the chemicals, vacuum the pool and periodically get your pool water tested by a professional. This is also the ideal time to make sure your swimming pool is free of leaks. Certified Leak Detection is an Orlando-based family-owned business, and leaders in servicing residential and commercial swimming pool leak detection needs for pools, spas and fountains. We also locate evasive leaks in concrete slabs, swimming pool decks and underground plumbing. We bring affordable solutions to major issues. Contact us – we are ready to help!